We welcome Naomi Besanson as the new VP for Ferns Area. Naomi has agreed to take over from Lesley Bayley who has been elected as our new Diocesan President. 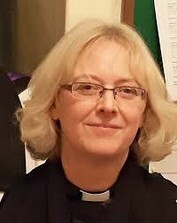 We wish Naomi every blessing as she takes over this new role in Mothers' Union. 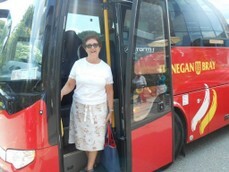 Naomi is a member of Ballycanew/Leskinfere/Monamolin Mothers' Union. 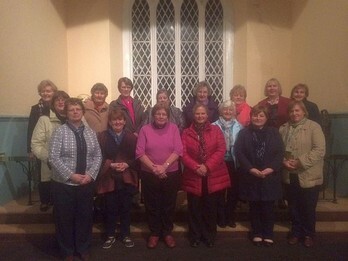 The Ferns Area Meeting took place in The Rectory, Park, Wexford on Monday 25th March. 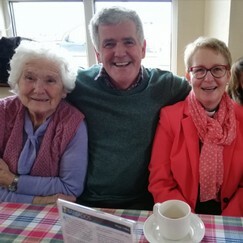 The meeting was very kindly hosted by Canon Arthur Minion, his wife, Susan, and the members of Wexford Branch of Mothers' Union. A Branch member welcomed us to Wexford for the meeting. Naomi Besanson, the newly appointed VP for Ferns Area, thanked everyone for coming and began the evening with a short service for Lady Day. Naomi then introduced the guest speaker for the evening, The Venerable Ruth Elmes. Archdeacon Elmes gave a very moving account of her "faith journey" ~ from being brought up in a Rectory, training to be a nurse and eventually being called for ordination. In a life that was tinged with much sadness she spoke with great dignity and recounted many humerous little stories. We are very grateful to Archdeacon Elmes for taking time out of her busy schedule to address the meeting. Following the meeting we were served delicious refreshments. Our thanks to Naomi for all of the thought and care she put into arrangements for the meeting. It was lovely to have the MU Enterprise stall there and our thanks to Phyllis Foot and Vivien Black for travelling down to Wexford. They had a lovely array of cards and gifts on the stall. 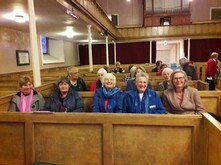 The Spring Area Meeting was very kindly hosted by Killanne/Killegney Branch of Mothers' Union on Monday 23rd April. 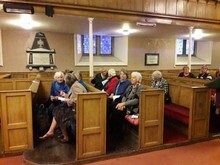 The meeting was very well attended and the guest speaker was Revd. Trevor Sargent. Revd. Trevor gave a very interesting talk on St. George and also gave us plenty of food for thought about how we can help our planet using the word PRAY. P ~ Planting trees. Trevor talked aboout the inportance of sowing tree and the good that trees do. R ~ Reducing & Re-using. We need to be cognisant of packaging we use, what can be recyled etc. A ~ Ask. We need to ask what we can do to help the environment. We are very grateful to Revd. Sargent for giving time out of his busy schedule to address our Area Meeting. 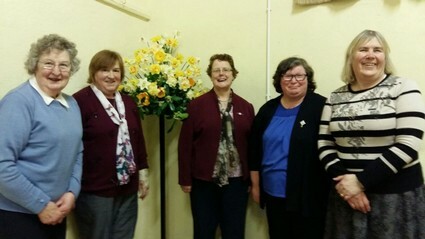 The Ferns Area Meeting took place in St. Mary's Church, New Ross, on Monday 15th October and it was very kindly hosted by New Ross/Fethard Branch of Mothers' Union. 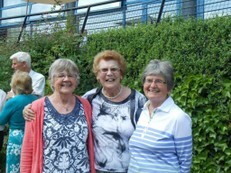 The evening was organised by the VP for Ferns Area, Lesley Bayley. Olive Power, Branch Leader, began proceedings by welcoming everyone to New Ross for the meeting. Lesley then led a short service, the lesson was read by Olive Power and Naomi Besanson accompanied the singing of two hymns. 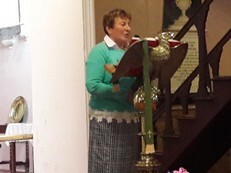 The guest speaker for the evening was Phyllis Grothier, current All-Ireland President of Mothers' Union. Phyllis spoke of the important work undertaken by Mothers' Union both at home and in other countries and the need for the organisation to promote what it does both among Branch members and parishes. The literacy programmes and the support also received from Bishop's Appeal. Knitting Projects ~ hats & matinee jackets for premature babies and stilborn babies, trauma teddies etc. We were reminded that teddies must be knit using wool that meets the proper safety requirement and any stuffing must also reach the proper safety standards. Also give the completed teddies a good squeeze to ensure that no pins/needles have been accidently left in them. Phyllis also spoke about MULOA and the importance of communication ~ ALL information needs to be shared at ALL levels in Mothers' Union. Lesley thanked Phyllis for her presentation, New Ross/Fethard Branch for hosting the meeting and thanked everyone for attending. 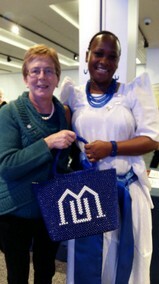 She also thanked Phyllis Foot and Vivien Black for bringing the Enterprise Stall to the meeting. 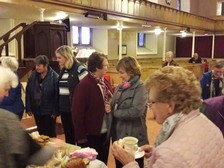 Following the meeting refreshments were served in the front of the church. The Ferns Area Vigil took place in St. Edan's Cathedral, Ferns on Saturday 24th November. 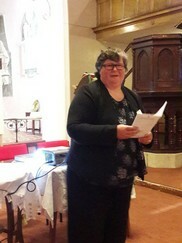 The Service was well attended and led by our Ferns Diocese Vice-President, Lesley Bayley. Our thanks to Lesley for all of the care, thought and effort she put into preparing for the Vigil. A representative from the Refuge in Wexford spoke to all present about the work of the Refuge and the urgent need for a newly purpose built buliding in Wexford. She said that plans have been drawn up for a new Refuge and it was hoped that building would commence in the very near future. All were thanked for their support of the Refuge and she thanked everyone for their contributions of toiletries, toys and goods for those who use this important facility. 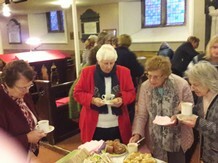 Following the Vigil Ferns Mothers' Union provided refreshments in the Chapter Room. May 2018 ~ Ardamine/Kilnamanagh Branch held a tea party hosted by Violet Walsh in her home to raise funds for Mums in May. 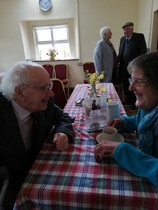 There was a wonderful array of food and all who attended enjoyed catching up with friends old and new. 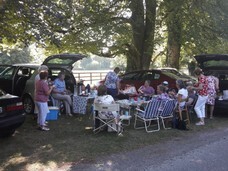 See some photographs from the tea party in the slide show at the bottom of the page on your left. In January 2019 Iris Checkett spoke to the Branch about her life as a nurse. The special speaker for the February meeting which will take place on Thursday 28th Feb. in Kilnamanagh Old School @ 7.30p.m. is the Revd. Nicola Halford. She will talk about her life journey to ordination and beyond. 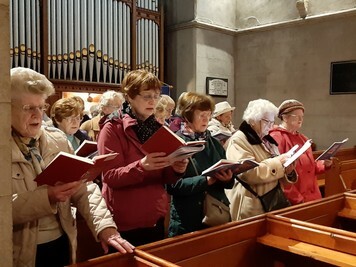 The Branch had a very successful tour of the local nursing homes in early October when they delighted the residents of Middleton and Valentia Nursing Homes with the singing of harvest hymns. The Branch also had a vey busy and productive time in Leskinfere Parish Hall when Mothers' Union members gathered to make school bags for the Team Hope Shoe Box Appeal. In November the Branch hosted a training session organised by Joan Blake, Training Officer, on the use of PowerPoint and Excel. 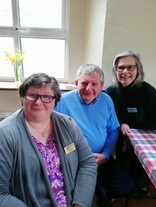 The Branch held their very successful lunch in aid of the Overseas Fund at the beginning of March 2019. Well done to everyone who puts so much effort into this occasion and the Branch really appreciates all the support they receive from members and people in the locality for this Annual Fundraiser. 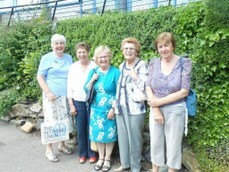 The Branch also held a prayer walk to Askamore Park in Askamore, Kilrush, which was for MUMS in MAY. 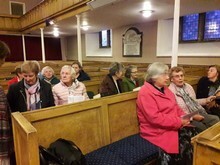 On 20th November 2018 the Branch was joined by some members from Killanne/Killegney Branch when Canon Payne gave a very interesting PowerPoint presentation on St. Margaret of Scotland. The evening concluded a cup of tea and a chat. In February the guest speaker at the meeting was Olga Rothwell from Beechdale Garden Centre. Olga gave the well attended meeting some very interesting gardening tips and she brought along a great display of Spring shrubs and bulbs. 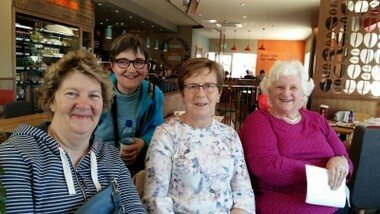 The Stillorgan and Blackrock MU stopped off in Enniscorthy for coffee on their summer outing to New Ross on Saturday 9th June 2018 and five members of Enniscorthy/Monart MU met them at the hotel to greet them and welcome them to Enniscorthy. 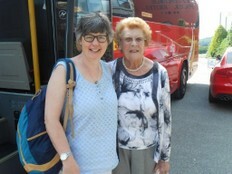 We presented them with a box of sweets for the bus journey and a copy of Route 66. The Opening Service for 2018/209 was held in St. Mary's Church on Sunday 18th November. On Tueday 27th November Ms Caroline Steacy gave a demonstration of Christmas Crafts. Enniscorthy members decorated a Christmas Tree for the Christmas Tree Festival 2018 in St. Mary's Church. The Christmas party was held in The Church Istitute. 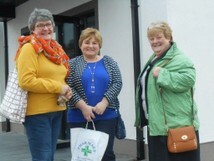 Enniscorthy & Killanne/Killegney Branches held a joint meeting in February. Pearl Olsen, Unit Coordinator for Action & Outreach, gave a very interesting and informative talk on the work of Mothers' Union overseas. collecting toiletries etc for distribution to the Women's Refuge as part of the Vigils for the 16 Days of Activism Against Gender-Based Violence. 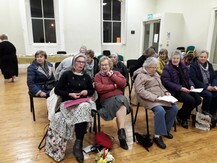 Members attended the Autumn Council in Durrow in November 2018 and some members also attended a training session on PowerPoint and the use of Excel in Leskinfere Hall. Also in November Mers Elvina Spencer very kindly hosted a knitting evening to create items for the premature baby unit in Wexford General Hospital. Members went Carol Singing in both Middleton & Valentia Nursing Homes on 8th December. 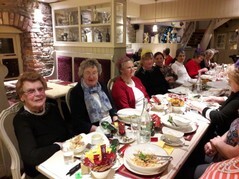 The Branch held their Christmas Dinner in the Eco Restaurant on 9th December. 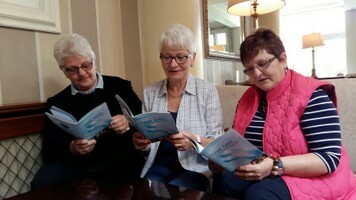 The AGM of the Branch for the new 2019 season took place on Monday 7th January and the following Officers were elected: Chairperson ~ Mrs Elvina Spencer, Secretary ~ Mrs Tania Hanan and Treasurer ~ Mrs Dorothy Stedmond. 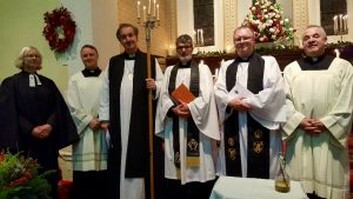 They were commissioned at a service in Christ Church Gorey on 20th January in a service which was led by the newly elected Diocesan President, Lesley Bayley and the preacher was the Rector and Diocesan Chaplain, Canon Mark Hayden. 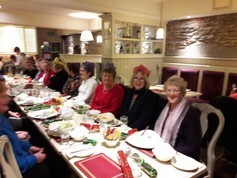 The Branch held their annual outing to the Christmas Pantomine on Monday 14th January. 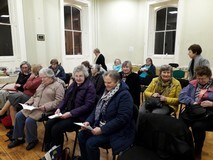 The Branch held an Open Meeting on Monday 18th February and the guest speaker was Sheila Haskins, a counsellor and psycho-therapist, who spoke on the theme of Mindfulness. Mrs Elvina Spencer opened the meeting and welcomed everyone. Sheila gave a very interesting tralk and taught everyone about noticing and being aware of our surroundings and learning to relax. Lesley Bayley, the Diocesan President, close the meeting by leading everyone prayers, the M others' Union preayer and the Grace. 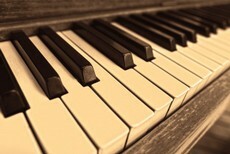 Lesley Bayley will be leading the Branch in a prayerful evening on 15th April. On June 27th 2018 The Branch organised a trip to Altamont Gardens to raise funds for "Mums in May". It was a beautiful afternoon and many enjoyed a stroll around the magnificent gardens and garden centre before meeting up for a picnic under the shade of the trees on the avenue. 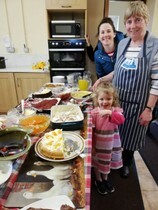 Everyone enjoyed a lovely afternoon of great food and chat. Many thanks to everyone who helped make the event such a wonderful social occasion. Thank you to June who had us "sniffing, shaking and feeling" to try and guess what was in the parcel. 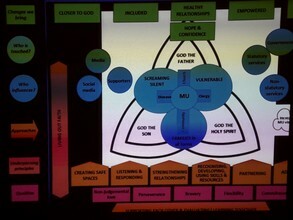 See pictures in a slideshow on the left of this page. 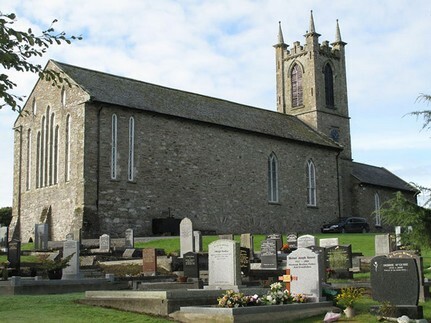 Killanne/Killegney Branch held their Opening Service for the new season on Tuesday 13th November 2018 in Killegney Church. 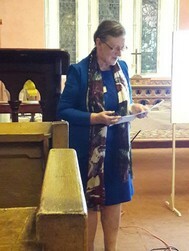 The service was led by the rector, Revd. Ian Cruickshank. 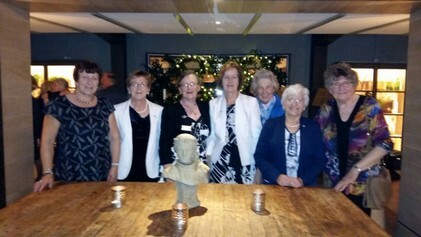 The Branch held their Christmas Get-Together in The Alamo Restaurant, Riverside Park Hotel on Monday 10th December. 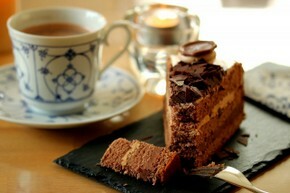 Everyone enjoyed a lovely evening of good food, chat and exchanging small gifts. 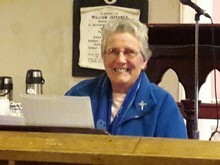 Our thanks to all of the Committee who put so much thought and effort into arrangements for the evening ~ especially Joan who organised some interesting challenges for us all. The January meeting was held at Farm View, Clonroche and Lorna Swan gave a very interesting talk about Verra Essential Oils. 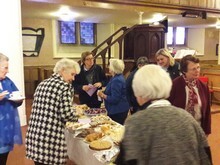 The Branch held a very enjoyable craft afternoon on Monday 11th March. Joan Blake & Florrie Dixon showed us how to create beautiful hand crafted cards. It was a lovely afternoon of fellowship, creativity and chat. There was also a very successful "Bring & Buy" Sale. 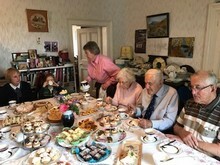 Congratulations to Bea Thorpe and her husband Brian who celebrated their 60th Wedding Anniversary during the year and they helped to cut the Celebration Cake during the Afternoon Tea Party to celebrate Mary Sumner Day at the home of Phyllis Grothier in early August 2017. Olive Power from the Branch also organises the trip to General Meeting every. The 2018 meeting took place in Swansea and all the work Olive puts into organising travel and accommodation arrangements is greatly appreciated. 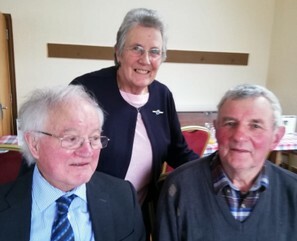 On 15th October 2018 New Ross/Fethard Branch hosted the Ferns Area Meeting. We were welcomed to New Ross by Olive Power. See report earlier on this web page. The Branch held an Afternoon Tea Party for "Mums in May" in the Rectory on Tuesday 15th May 2018 from 3-5p.m. The Branch held their Opening Meeting for 2018/2019 on Thursday 22nd November when Mrs Francoise Davision was elected to succeed Susan Minion as Branch Leader and Mrs Edna Rothwell was elected as the new secretary. Ms Julie Grant continues in the role of Treasurer. The Christmas "Get Together" took place in The Rectory, Park on 15th January. It was a very enjoyable occasion with delicious starters and desserts supplied by members and the majin course provided by Susan Minion.